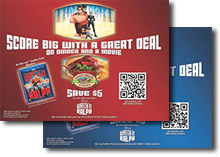 WICHITA, Kan. - March 4, 2013 - 'Wreck-It Ralph,' Walt Disney Pictures' hit arcade game-hopping animated adventure that was released theatrically in late 2012, is featured with Cargill's Honeysuckle White and Shady Brook Farms turkey brands in a springtime promotion that offers consumers a $5.00 mail-in rebate when they purchase a fresh turkey product and a Blu-ray combo pack. The promotion kicks off March 5 with the 'Wreck-It Ralph' Blu-ray release, and runs through April 30. 'Wreck-It Ralph,' Walt Disney Pictures' hit arcade game-hopping animated adventure is featured with Cargill's Honeysuckle White and Shady Brook Farms turkey brands in a springtime promotion. From Walt Disney Animation Studios, 'Wreck-It Ralph' takes viewers on a hilarious journey. For decades, Ralph (voice of John C. Reilly) has played the bad guy in his popular video game. In a bold move, he embarks on an action-packed adventure and sets out to prove to everyone that he is a true hero with a big heart. As he explores exciting new worlds, he teams up with some unlikely new friends including feisty misfit Vanellope von Schweetz (voice of Sarah Silverman). The film is directed by Rich Moore, (“The Simpsons, ” “Futurama ”) recipient of the 2013 Annie Awards (Animated Film Society) for Best Director and Best Picture for his work on 'Wreck-It Ralph'. 'Wreck-It Ralph' features an all-star voice cast including Jack McBrayer as the voice of Fix-It Felix Jr. and Jane Lynch as the voice of Sgt. Calhoun, plus breakthrough bonus features that take viewers even deeper into the world of video games. Disney's 'Wreck-It Ralph' has something for every player. Over an hour of all-new bonus material is featured on the Digital and Blu-ray Combo Pack, including deleted and alternate scenes, plus the Academy Award®-winning animated short 'Paperman' (Best Animated Short Film, 2012) and much more.